For many Hongkongers, a typhoon signal late in the week might cause concern over the weekend's junk boat trip or long-awaited alfresco wedding. Others may be pleased that they can get a day off work. 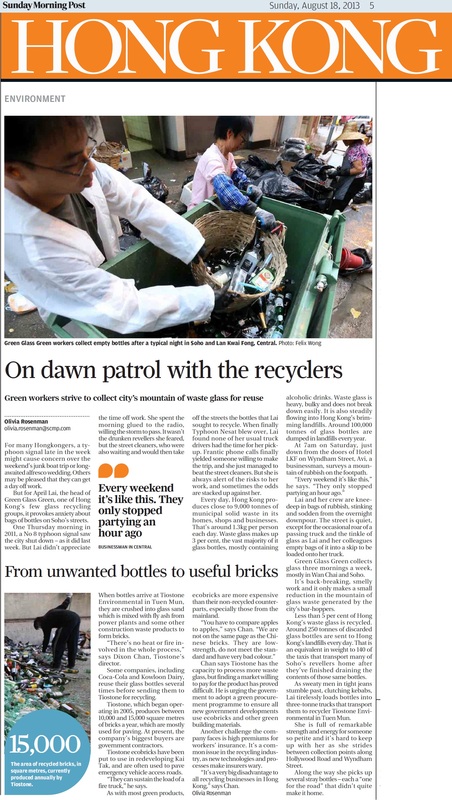 But for April Lai, the head of Green Glass Green, one of Hong Kong's few glass recycling groups, it provokes anxiety about bags of bottles on Soho's streets. One Thursday morning in 2011, a No8 typhoon signal saw the city shut down – as it did last week. But Lai didn't appreciate the time off work. She spent the morning glued to the radio, willing the storm to pass. It wasn't the drunken revellers she feared, but the street cleaners, who were also waiting and would then take off the streets the bottles that Lai sought to recycle. When finally Typhoon Nesat blew over, Lai found none of her usual truck drivers had the time for her pick-up. Frantic phone calls finally yielded someone willing to make the trip, and she just managed to beat the street cleaners. But she is always alert of the risks to her work, and sometimes the odds are stacked up against her. Every day, Hong Kong produces close to 9,000 tonnes of municipal solid waste in its homes, shops and businesses. That's around 1.3kg per person each day. Waste glass makes up 3 per cent, the vast majority of it glass bottles, mostly containing alcoholic drinks. Waste glass is heavy, bulky and does not break down easily. It is also steadily flowing into Hong Kong's brimming landfills. Around 100,000 tonnes of glass bottles are dumped in landfills every year. At 7am on Saturday, just down from the doors of Hotel LKF on Wyndham Street, Avi, a businessman, surveys a mountain of rubbish on the footpath. "Every weekend it's like this," he says. "They only stopped partying an hour ago." Lai and her crew are knee-deep in bags of rubbish, stinking and sodden from the overnight downpour. The street is quiet, except for the occasional roar of a passing truck and the tinkle of glass as Lai and her colleagues empty bags of it into a skip to be loaded onto her truck. Green Glass Green collects glass three mornings a week, mostly in Wan Chai and Soho. It's back-breaking, smelly work and it only makes a small reduction in the mountain of glass waste generated by the city's bar-hoppers. Less than 5 per cent of Hong Kong's waste glass is recycled. Around 250 tonnes of discarded glass bottles are sent to Hong Kong's landfills every day. That is an equivalent in weight to 140 of the taxis that transport many of Soho's revellers home after they've finished draining the contents of those same bottles. As sweaty men in tight jeans stumble past, clutching kebabs, Lai tirelessly loads bottles into three-tonne trucks that transport them to recycler Tiostone Environmental in Tuen Mun. She is full of remarkable strength and energy for someone so petite and it's hard to keep up with her as she strides between collection points along Hollywood Road and Wyndham Street. Along the way she picks up several stray bottles – each a "one for the road" that didn't quite make it home. When bottles arrive at Tiostone Environmental in Tuen Mun, they are crushed into glass sand which is mixed with fly ash from power plants and some other construction waste products to form bricks. "There's no heat or fire involved in the whole process," says Dixon Chan, Tiostone's director. Some companies, including Coca-Cola and Kowloon Dairy, reuse their glass bottles several times before sending them to Tiostone for recycling. Tiostone, which began operating in 2005, produces between 10,000 and 15,000 square metres of bricks a year, which are mostly used for paving. At present, the company's biggest buyers are government contractors. Tiostone ecobricks have been put to use in redeveloping Kai Tak, and are often used to pave emergency vehicle access roads. "They can sustain the load of a fire truck," he says. As with most green products, ecobricks are more expensive than their non-recycled counterparts, especially those from the mainland. "You have to compare apples to apples," says Chan. "We are not on the same page as the Chinese bricks. They are low-strength, do not meet the standard and have very bad colour. Chan says Tiostone has the capacity to process more waste glass, but finding a market willing to pay for the product has proved difficult. He is urging the government to adopt a green procurement programme to ensure all new government developments use ecobricks and other green building materials. Another challenge the company faces is high premiums for workers' insurance. It's a common issue in the recycling industry, as new technologies and processes make insurers wary. "It's a very big disadvantage to all recycling businesses in Hong Kong," says Chan. This entry was posted in English, News and Events, 媒體報導, 新鮮熱報, 最新消息. Bookmark the permalink.